Equip your microscope to show polarized light. Eyepiece polarizer size: 28 mm I.D. Observe living materials, mineral thin sections, and other items that demonstrate the effect of polarized light and color contrasts in birefringent objects with your existing microscope. The polarizing filter slips over the eyepiece of the scope, while the stage plate fits on the existing stage and is secured by its nonslip surface. 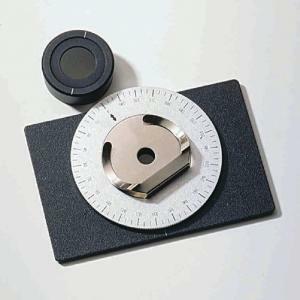 A calibrated rotating disc, marked in 5° increments and numbered every 15°, is centered on the stage plate; its clips hold your microscope slide. The eyepiece polarizer fits most microscopes.